Wherever possible, information links have been provided to sites that information has been sourced from. 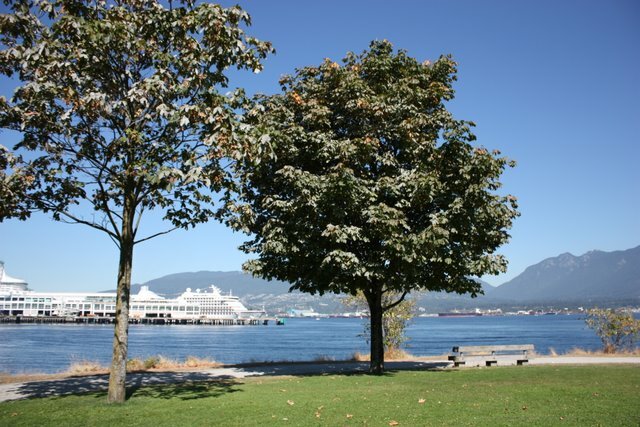 Otherwise all thoughts and writings are my own, and are from interview notes with Don Larson**, (Crab Park Water for Life Society) and others in the community. If you feel there are inaccuracies or omissions of content please advise and I will do my best to correct and update the information. 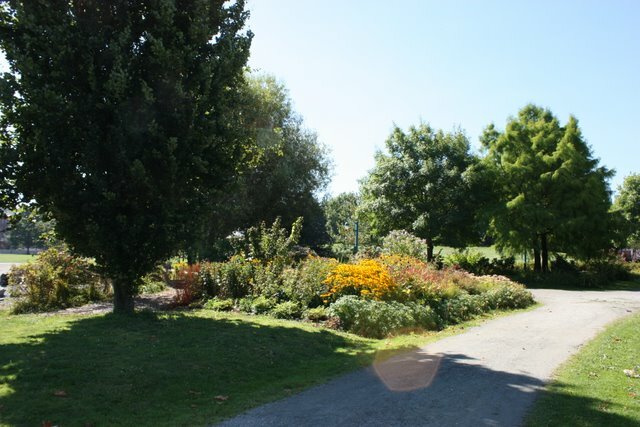 This is a virtual tour of the park as of this writing in 2009 that begins by the marsh pond, circles the small northern loop and then circles through the full park. In 1985 as studies were being done prior to the park being built, a UBC student report counted 26 species of birds active in the area. June of 2010 has seen recent Heron activity again, a pair has been spotted fishing on several occasions from the beach and the Bald Eagle pair is still nesting on the port light stanchions within site and are witnessed circling, looking for food regularly. 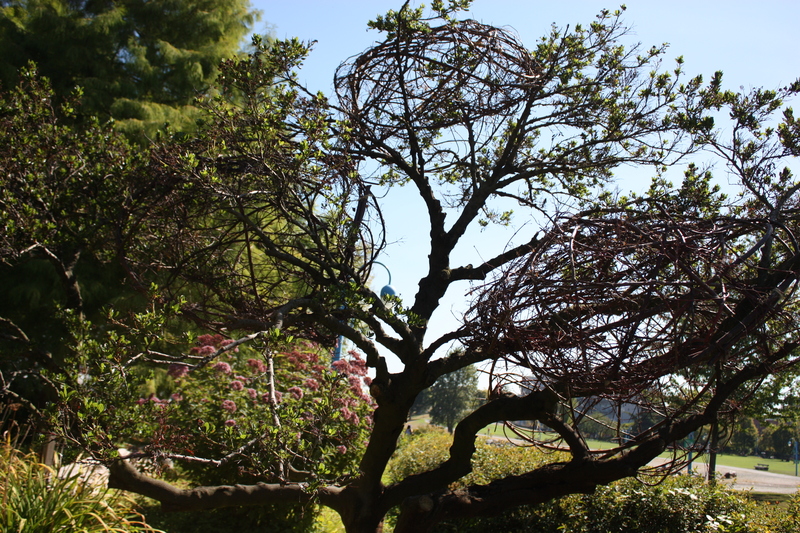 California Lilac: This tree took a hard hit in the winter of 2008/09- like many California Lilacs observed in the city; it lost many branches from the unusually cold dry winter. However, in the Spring of both 2009 and 2010 bushtits have made their nest in the branches of this tree. Working with community at the Oppenheimer Park ladies tea group, Enterprising Women Making Art and the Downtown Eastside Women’s Centre, the four dogwood orbs were woven and installed to recreate a canopy shelter for nesting birds next spring. 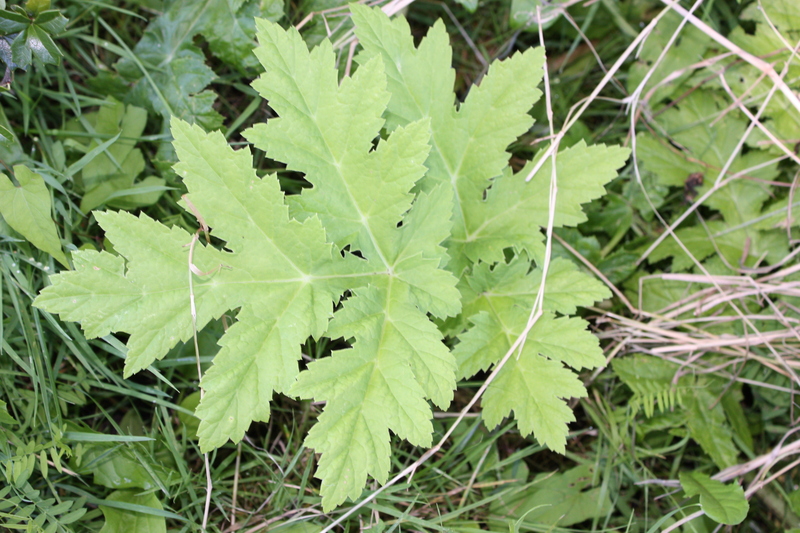 AKA: Hogweed (Heracleum mantegazzianum), is a member of the carrot or parsley family. The sap from this plant may cause a severe skin reaction known as photo-dermatitis or photo-sensitivity. The reaction can happen up to 48 hours after contact- this is easily avoided if the area of contact is washed well with soap and water before any sun exposure. An invasive/ introduced species, I have heard the Giant Cow parsnip first became an issue in the lower mainland in the late 1990’s. David Gowman, a local artist, makes natural horns with the stocks. Harvesting them mid summer he allows them to dry a minimum of a year before working with them. This is the native, fast growing shrub that has been used for most of the woven projects. I like using the dogwood specifically because it is flexible year round(any previous years growth) , unlike willow which needs to be harvested in the winter, then soaked before use. Did I mention it is a fast growing shrub? It needs to be cut back regularly for maintaining view corridors in the park. Artist Statement:Hand-hewn timbers are carved and joined into a cross-shaped floor with a gateway above.The sculpture is laid out to the points of the compass with the gateway aligned to directly receive the rays of the summer solstice sunset.The cross is supported by local granite foundation stones.The entire piece is anchored by the weight of the big erratic block set in the center. 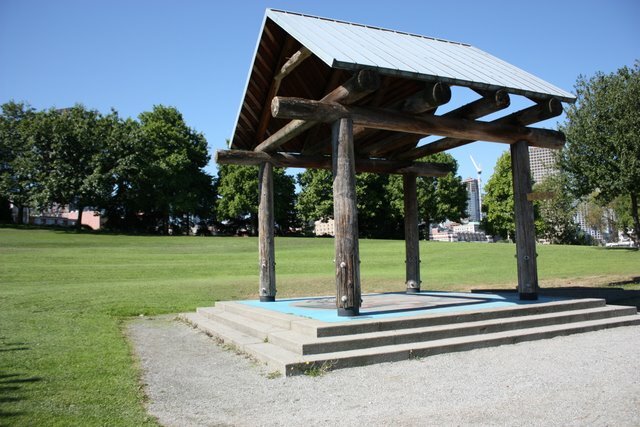 I built the entire piece using traditional joinery, without any fasteners.The work was installed with help form local community, contractors and art students.” Trees! 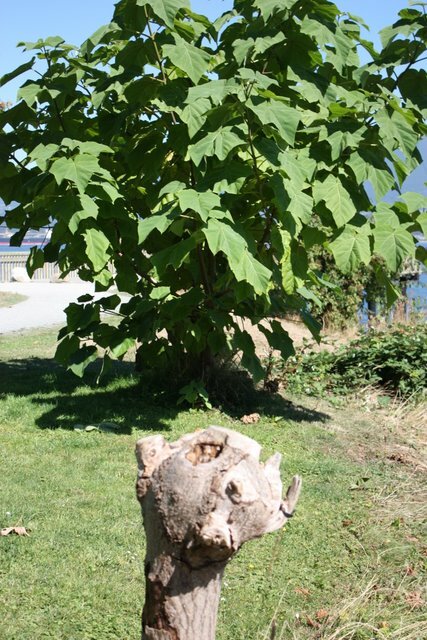 The Giant Maples-This species is one of two native maples in BC, the other being vine maple. 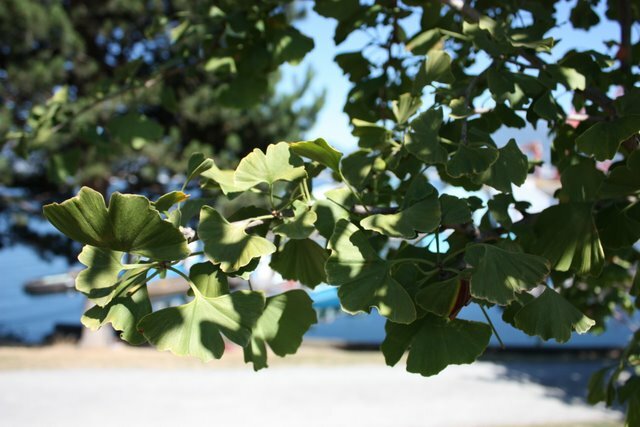 The Ginkgo Tree or Maidenhair tree is the last surviving member of a family of trees called the ginkgos, they dominated the land for 250 million years and are referred to as a “living fossil” growing wild in a small area of Chekiang province in China, it is widely planted as an ornamental. 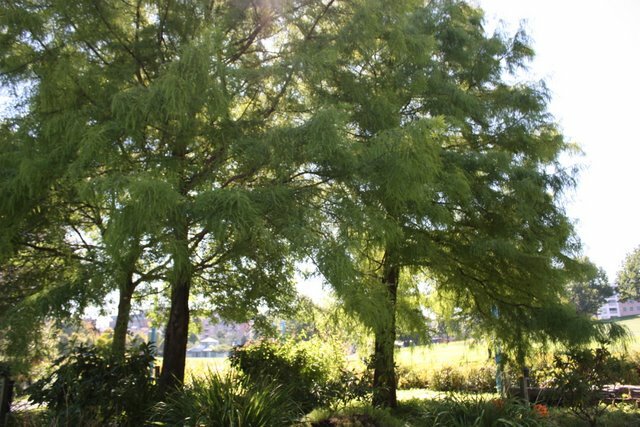 Metasequoia- Another very cool tree, a conifer that changes colour and drops it’s needles, it is also referred to as a living fossil. Thought to be extinct, it was rediscovered in China during WWII and shortly after the war was propagated for ornamental planting. The Katsura is known for the burnt sugar smell that the leaves emit in early/mid autumn when the leaves have turned yellow, notice it in early October when you walk through the park! Paulownia tomentosa or Empress tree-This little tree has had it’s branches snapped off repeatedly by a someone in the park over the last few years; an off shoot has grow up and begun doing quite well, 15 ft from the original tree….Listed as an invasive through much of the US, it seems to participate fairly well here. A native to China, it was introduced to Japan centuries ago and became a main wood with both economic and cultural significance.Click here for interesting stories and history associated with the Empress Tree: I have also read that a purple dye for textiles can come from the tree, but I have not discovered if it is the roots, bark or flower that is used. David Gowman, the artist mentioned earlier uses Empress stocks for horn making as the centre pith is hollow and easy to burn/carve out for instrument making. 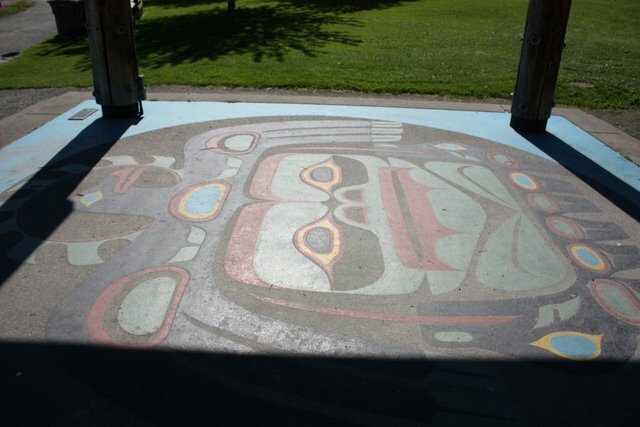 Irly Bird Pavilion: built at time of park construction, the pavilion was donated by Irly Bird lumber with painted floor design by Richard Pooley AKA TORA, a local artist. Both Native and Egyptian influence is in the symbol design featuring a crab in the centre and two dolphins at the base. Behind the pavilion notice the stepped hill that serves as audience seating. This was originally designed as graded slopes that would be paved to serve the purpose of a wheelchair accessible ramp connecting to a pedestrian crossover that would link Columbia St over the train tracks to the park. After many political attempts and rumblings the crossover was never built. It seemed to get hung on if it should be at the foot of Columbia, as designed and serve locals, or be re-thought and go at the foot of Carroll and serve tourists and Gas town. 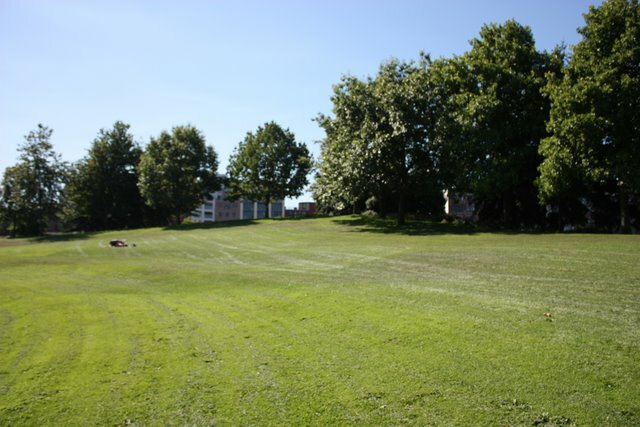 Imagine how different this unknown gem of green space would be if a pedestrian walk over to Gas town existed. Water Access: When the park was in early planning days, a survey was done of approx. 350 people in the neighbourhood asking what they wanted in a waterfront park. Being able to touch the water was a constant in feedback received. 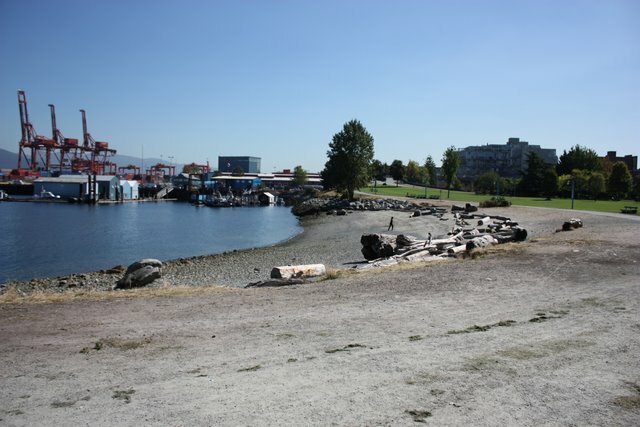 Park activists felt a trip to Seattle’s Elliot Bay showed “what not to do” in the way huge boulders and rocks had been placed between the water and park making the water virtually unreachable. 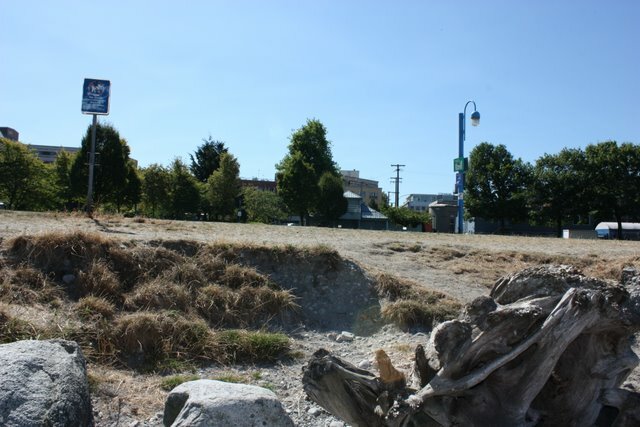 The plan was made to grade Crab Park beach as softly as possible so the pathway gently drops down to the waters edge allowing easy access. Looking south from the beach, it is hard to imagine that approx. 95% of the park was underwater pre: 1986. Landfill from EXPO’86 projects makes up the soil base of the park. The original waterline was somewhere around the park “clubhouse” visible in the far background of this photo- look for the peaked roof. In honour of the spirit of the people murdered in the downtown Eastside. Many were women and many were Native Aboriginal women. Many of these cases remain unsolved. All My Relations. 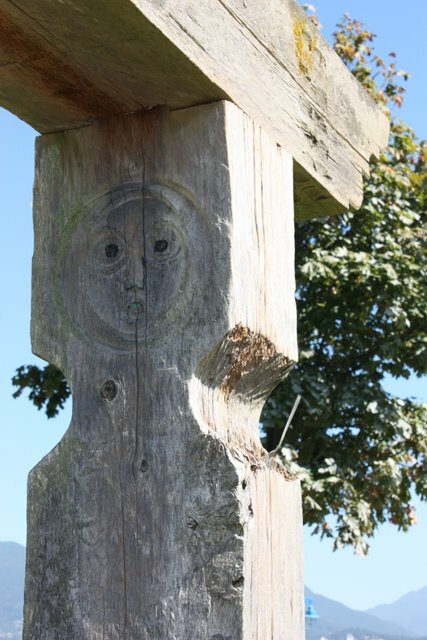 This memorial stone has become a very powerful, cherished and often visited memorial for the community. 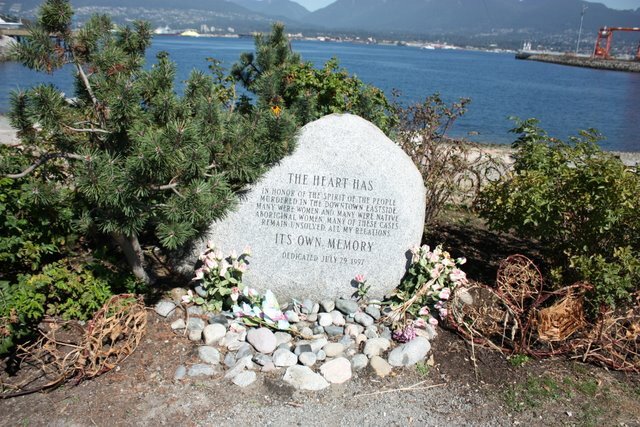 The memorial was written and placed by Don Larson as a part of his parent’s legacy working in conjunction with Vancouver Parks Board. Don sees the boulder as similar to a newspaper, disseminating information to the community. John Newall on Fraser St. did the engraving and a local truck driver assisted with placing the stone. Community worked on creating the border now circling the memorial planted area in hopes of re-training dogs to stay out of sniffing or digging around the planted area. 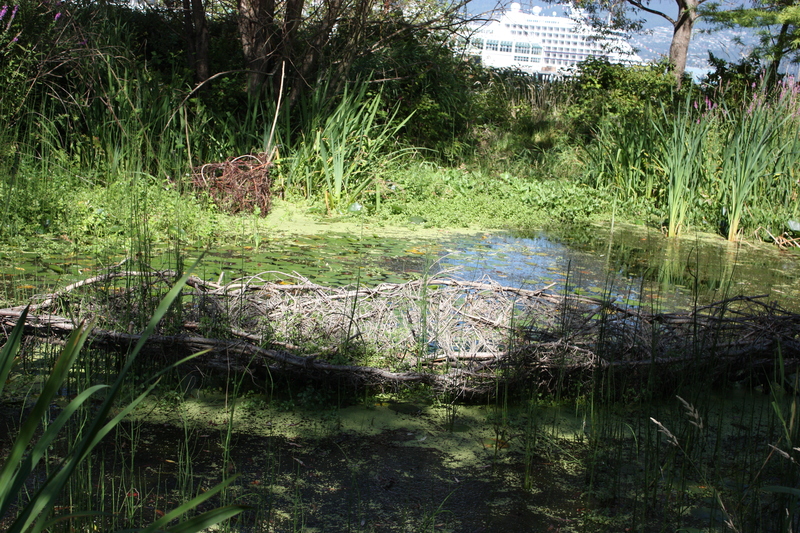 Materials used for the fence are all materials that were gleaned from the park. 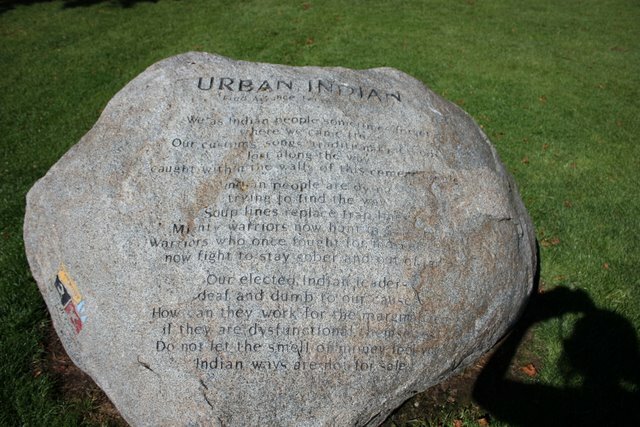 V2K project: Story Stones Urban Indian: poem by Fred Arrance, past director of the Aboriginal Front Door. 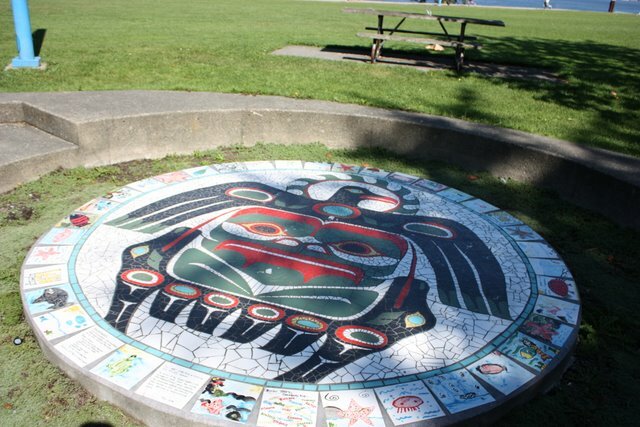 Walking Tour, 2001:A series of 17 distinct mosaic tiles strategically placed in the Downtown Eastside , each portrays a different facet of Vancouver’s rich and diverse history.The Walking Tour was planned, designed and constructed in six weeks by 170 residents of the DTES. 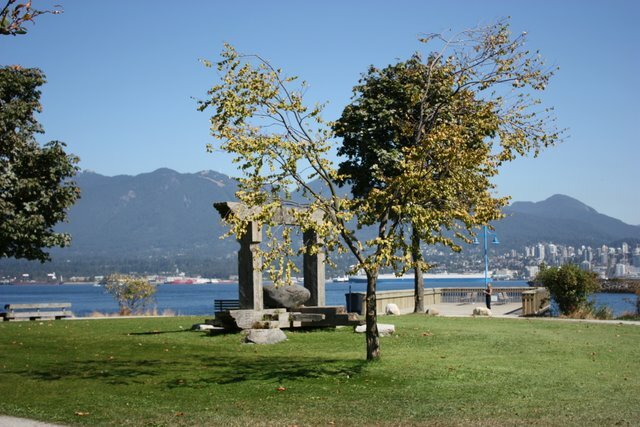 The project was a partnership between Carnegie Community Centre, residents and the federal government, under the Vancouver Agreement.Carnegie Community Centre administered the program, The local residents collaborated with historians and businesses to research historical incidents that make Vancouver’s past so unique. Mosaic Leah Decter was lead artist working with community from Ray Cam. 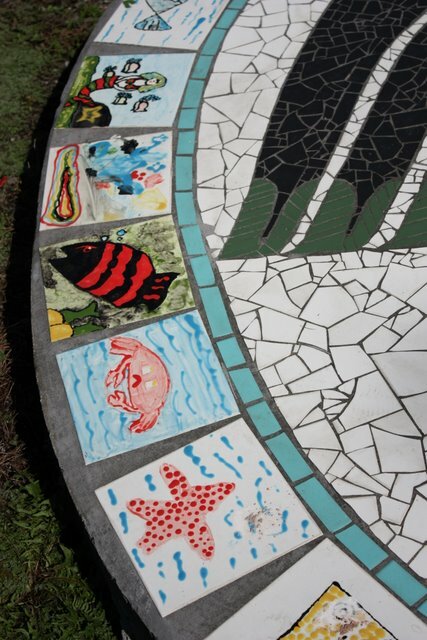 Funded by Neighbourhood matching funds, (image design: Richard Pooley AKA: TORA, same design as the painting on the Irly Bird pavilion) Mosaic by Leah Decter- with Ray Cam“I was asked by Ray Cam Community Centre to do a project to redo Pooley’s design in mosaic. We did it in 2006 shortly after I moved to Winnipeg. 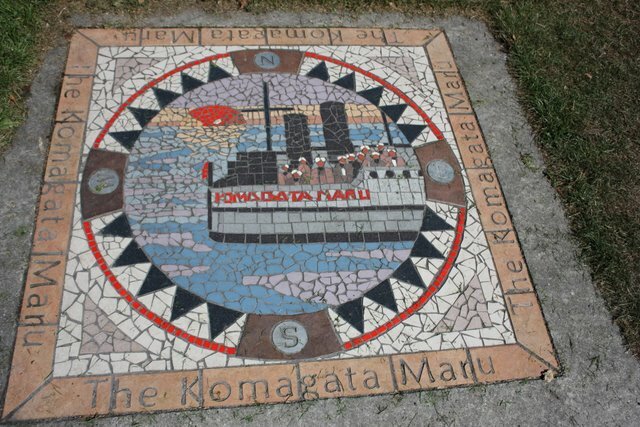 I had done a couple of projects where street involved youth designed and made mosaics for public sites in downtown Vancouver from 2001 to 2005. Ray Cam wanted me to translate the design into mosaic and make a component of the project that the young kids could get involved with. I hired two of the youth who had participated in my previous project to work with me to do the mosaic and Ray Cam staff worked with the kids to make the tiles on themes relating to the water to connect with the site.” Other community mosaic projects by Leah: Watch yOUR Step 1 and 2. 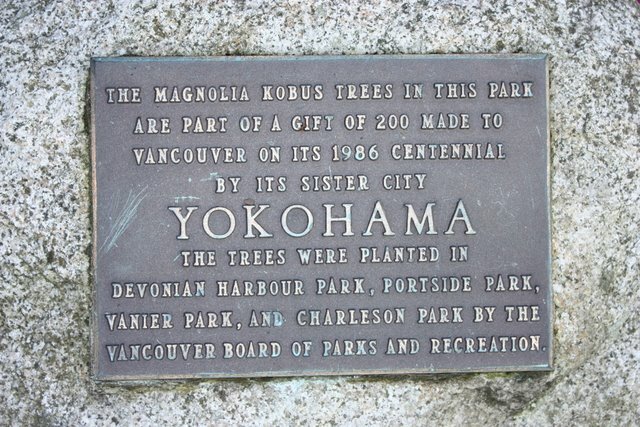 Dedication garden: City of Yokohama. In 1986 80 white magnolias were gifted to the city, a long row was planted along the southern edge of the park, over the period of a few years they were unfortunately all stolen. Water Feature? 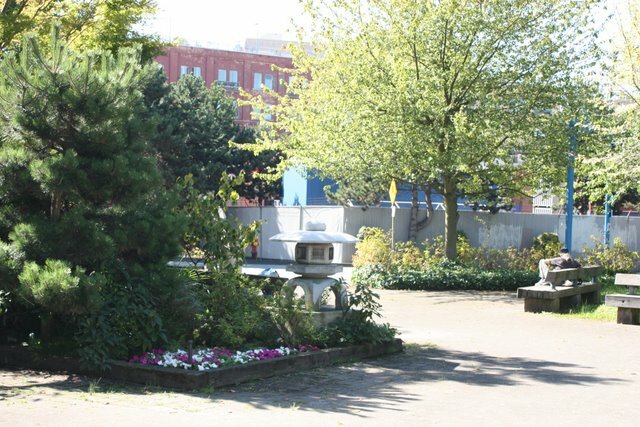 : In the original park plans, a water feature was scouted for this site. The drain exists as well as the sloped area for a rock-bed water fall. Someone somewhere nixed this idea as being too dangerous, and a potential lawsuit if someone hurts themselves. This anecdote of early park planning speaks of the time this park was designed- predating Vancouver’s love affair with water features that I would guess is a part of every park in Vancouver build between 1995-2005. Childrens playground: originally donated by a local businessman through Chinese Community S.U.C.C.E.S.S. program, the park equipment was replace and upgraded in approximately 2007. Aside from the kids use, the new matting installed seems to be popular for morning yoga folk as well as Tai Chi practitioners. 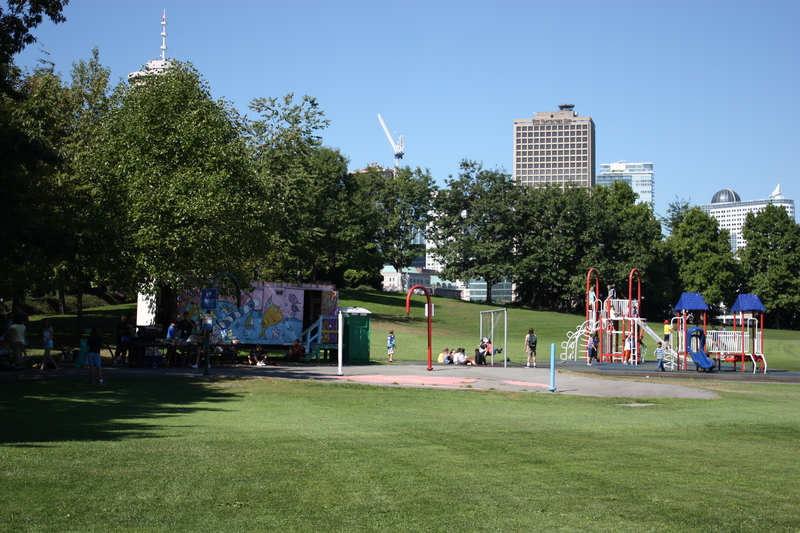 The water fountain for children is turned on for large park events and occasionally in the summer when childrens Ray Cam camp programs are in attendance.